The 1939 Studebaker Coupe Express -The Ultimate Retro Driving Machine! The 1939 Studebaker Coupe Express is an all fiberglass bodied Street Rod that utilizes the existing production priced and widely available Chevrolet S series pickup truck as the donor vehicle to be used as the rolling chassis. It's design and production is based on practicality and street-worthiness of a production vehicle. The goal is an affordable street driven modern street rod with the distinctive flair of vintage era design. 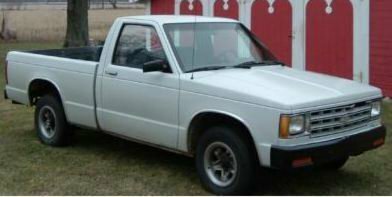 The 39 retains the all steel cab and frame of the Chevy production donor truck thereby assuring complete structural integrity not available with any other fiberglass "kit cars". A truly problem free Street Rod, the completed 39 Studebaker passes all points of the NSRA safety inspection. 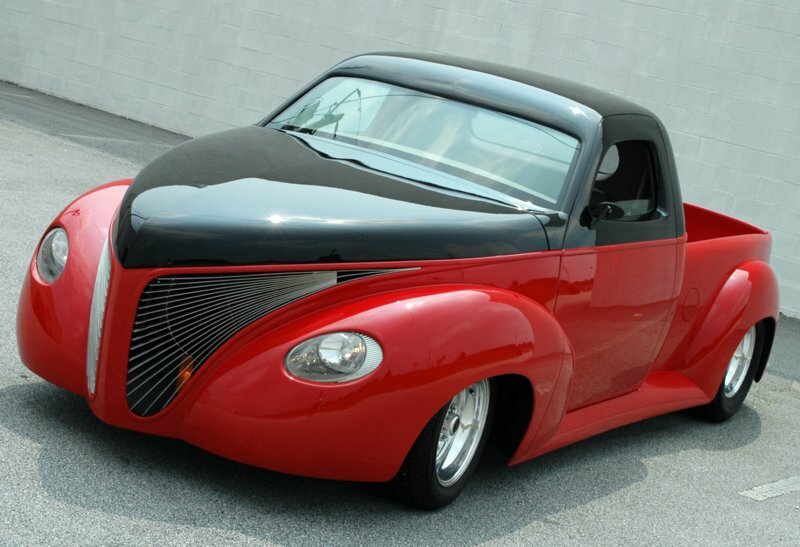 The Body design is based on the 1939 Studebaker Coupe Express pickup. The radical modern restyling is accomplished with: 4.5 inch top chop, 8 inch bed channel, 6 inch front clip channel, 4 inch bed section, Completely rolled & filled bed, shaved & filled doors, integrated running boards, seamless cab, frenched lights & muted trim. On the surface, the 39 Custom Studebaker Coupe Express begins at a place where most glass concepts have to radically modify to achieve. When taken to the next level, a well planned build-up of an otherwise "standard" modified body achieves a distinction that easily becomes the standard mark for the body style. In the modified pickup truck world, specifically the 39 Coupe Express, this version of the idea easily achieves the distinction as the standard bearer. Long, Low, Sleek, & Smooth.. Simply stated, the design for this build-up exists in a few carefully selected "theory to practice" custom build ideas� Long, Low, Smooth, & Simple. It could also be called "elegant and sleek and smooth"
To expand on those ideas, Long & Low in this case means a nice long clean & uninterrupted line, achieved by the elimination of anything that could be interpreted as clutter: bumpers, door handles, side mirrors, hinges, drip rails, hood trim, minimal use of chrome and any other unnecessary visual distractions. The balance however is to avoid a sanitized look. This is accomplished with using simple paint adjustments that compliments what's already there. To the extent that paint can be a distraction, graphics, accent lines or any other similar "add on" color hype should be avoided as it tends to misdirect the overall design. All Rod build-ups have to start with careful consideration of the three most important elements of a successful look. These are, the wheel & tire combo, the paint, and the stance. This is particularly true of any rod which borrows elements from and pays homage to it's original counterpart. The 39 Custom Coupe Express is reminiscent of the 60's one off customizations produced by the likes of the Barris Brothers, Bill Cushenberry, Ed Roth, Darryl Starbird, and a myriad of others who pioneered the Custom Rodding experience we enjoy today. Building a retro ride almost demands a certain obvious acknowledgement of the period from which the custom was birthed. Recognition of details like this at the outset results in doing the little things that add up to result in a truly distinctive design enjoyed to the hilt with the 39 Studebaker. "Radically Different" At Wilder Street Rods, our emphasis is on creating the 39 Studebaker Custom Coupe Express as a turn -key, ready to ride, made to order production Street Rod. Our road ready concept is a totally unique, fully functional and drivable modern Street Rod.